Our April WiN meeting is Thursday, April 4th. 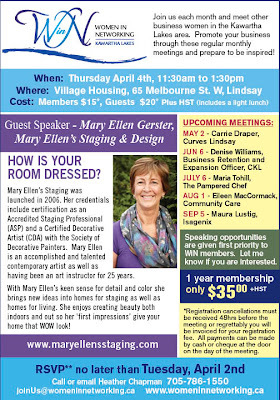 Mary Ellen Gerster of Mary Ellen's Staging & Design will be our guest speaker. Please let me know by email if you are planning to attend. Full details below. 19. Gazel Chamberlain-Jibb - PILL Method Inc.